Qualified for Obedience class 2 with 180.5p/200p at 18.5 months old. Approved beginner class tracking. Rally obedience – competing in Mästarclass (highest class) and has titles in all four classes. Axi has had three litters; E litter, F litter and H litter – you will find more information about the litters on each litter page. A common feature in Axi’s litters are that they have a high drive and are wonderful to train with, they have a good interest in objects and a lot of fighting spirit. They are real working dogs and very mentally stable. I am extremely pleased with all of Axi’s litters! Axi is from a litter born in Germany, sired by my Silo. Axi’s mom – Bijou – is a fairly small female who has competed in agility in Germany and France with good results. Bijou has HD A/A and has the title German Show Champion (VDHCH). In Axi’s litter there was 9 puppies of which 8 are x-rayed and all have hips free from dysplasia! Axi is a very easy dog, she will do anything I want to and with great joy! She loves to work and it doesn’t matter where we are or what weather conditions – as long as she can work. Axi is very quick witted and catches on very fast to what I want since she is trained with operant conditioning. She is very attuned to me and wants eye contact but she is not a ”soft” dog! She loves to swim in pursuit of her ball and on the walks she and Scylla will run like crazy! Axi really likes to run so it is quite a challenge for her to walk slowly, she wants to run! She likes the wildlife and keeps an eye on the deers around here, but she always comes when I call and she KNOWS that hunting is forbidden. She is my ”service dog” – brings me pens, paper, paper clips, envelops when she finds them on the floor. Once she brought me a piece of wine gum! She really loves to work! Axi is very fond of our cats, when the cats come for a walk with us Axi will herd them and the cats let her do it, they are quite used to it! I have done some herding with Axi and she passed the French Herding Test with flying colors in France, May 2007. The judge commented: ”Very good working dog!”. We have also passed the Swedish (still unofficial) Herding Test with very good result. The judge commented that Axi has a very good feeling for the sheep. We have competed in Obedience, we debuted in Brevet Obedience in France when she was 12 months and she did great, not thanks to me since I was totally out of form that day…. that didn’t bother Axi though! 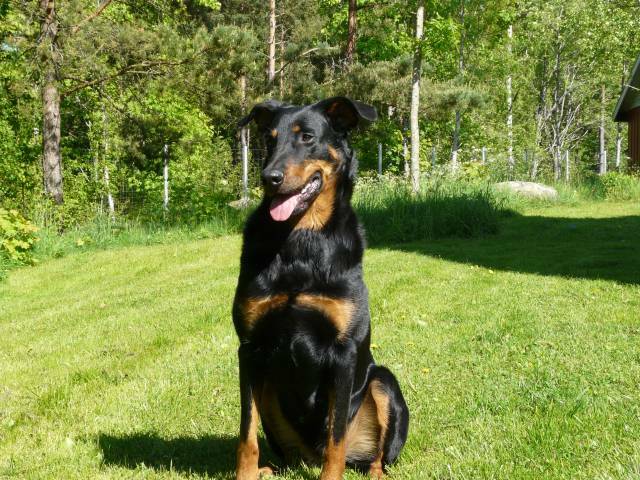 Axi is qualified for Obedience Class 2 in Sweden and she competes in Rally Obedience with good results! She is at the moment (May 2013) about to start in the Master class in Rally, that is the highest class. Axi has participated in several shows with very good results! She has a number of Certificate Quality and also a R-CACIB and a BOS. She is a small and flexible female.